Researchers from the European Space Agency and NASA are seeking volunteers for a 60-day bed-rest study, which aims to test the effects of 'artificial gravity' as a possible solution to the negative effects of zero-gravity on the human body. 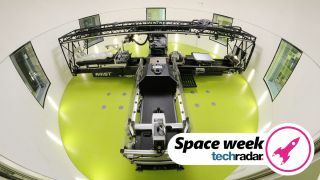 Eight laid-back individuals (four male and four female), who will be confined to bed for two months at the German Aerospace Center's :envihab facility. It might sound like a dream job, but don't be too hasty – as a volunteer, you won't be allowed to sit up at all, even for meals, and must keep at least one shoulder in contact with the mattress at all times. Even worse, the top of your bed will be angled down by six degrees, so fluids move towards your head. This bed rest will have a similar effect on your body to low gravity, leading to muscle and bone atrophy. To find out whether artificial gravity could effectively prevent this, you'll be taken for a daily spin in a centrifuge, pushing the blood through your extremities. "Although the effects of weightlessness are primarily investigated on the International Space Station [ISS], analogues such as :envihab are helpful when studying certain research topics under controlled conditions on Earth," said Leticia Vega, associate chief scientist for international collaborations for NASA’s human research program. "These findings will later be validated on the ISS." The first batch of volunteers arrive at the test center this week, and a second group are due to take their places in September. The researchers are still seeking volunteers for the second group – particularly women – so if we haven't succeeded in putting you off completely, you can sign yourself up (note that the website is in German).